This just in from my pal Lucas Klein, who is on the scene in Hong Kong where people are in the streets in vast numbers protesting for democracy. Reporting has been suppressed in China, but the word is getting out elsewhere. I went to the Occupy Central demonstrations this afternoon. I had previously been annoyed and disappointed that the movement’s messaging and organizing had been so deficient in English and Mandarin, resulting in my never knowing where or when their actions had taken place (certainly it makes sense that the primary language of the events is Cantonese, but particularly when up against media representation in Mandarin that’s almost exclusively negative, having a comprehensive campaign that includes explaining to mainlanders what our goals are and how we’re actually on the same side as you becomes all the more important). Finding the action was not difficult, but it wasn’t exactly straightforward, either. 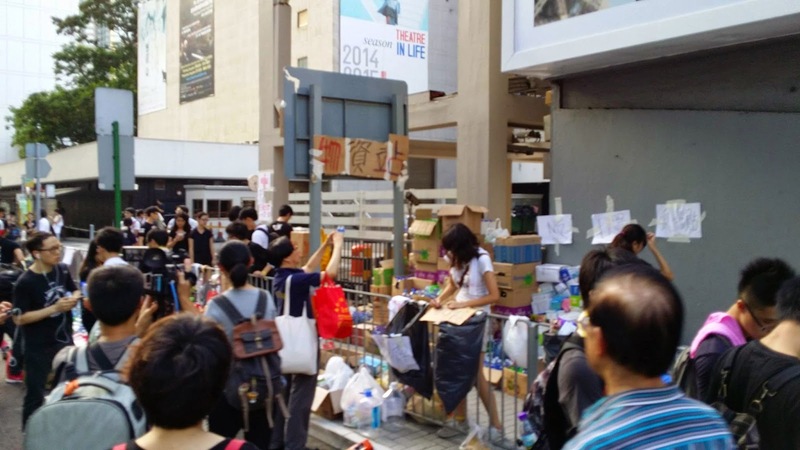 It’s called Occupy Central because it had been, in the days of Occupy Wall St., primarily in the Central district; it’s now moved to Connaught Road, a stretch of highway linking most government and administrative buildings along the northern coast of Hong Kong island. The occupation this afternoon stretched from roughly Statue Square to past the Academy for Performing Arts (red and blue on the map; a distance of a little over a kilometer, or three-quarters of a mile), but the first challenge was getting there: in part because so much traffic has been obstructed, and in part out of fear of traffic being obstructed, most of the bus lines had been rerouted or halted. I took a tram, which terminated a good three kilometers from where I wanted to go. I could see no signs of any demonstration going on at first, but then I realized that Des Voeux Rd Central, one of the main thoroughfares of that part of Hongkong, was all but devoid of traffic—no cars, no buses, no trucks, no taxis… By the time I got to the primary intersection of Central (Des Voeux, Pedder, and Chater) I saw that two of the streets had been blocked off by police, but protesters were nowhere to be found. This continued as I walked past the former Legislative Council building and the HSBC headquarters, whose gates were lowered and locked—though I saw no one demonstrating yet, it was clear that the official establishment of Hongkong, the government and the financiers, were terrified. Only a few minutes later, though, I found the crowd. Last night I saw the images of police launching teargas into crowds of demonstrators, but the tears that caught me were on seeing so many people—as thick a crowd as I’ve ever seen, as far as the eye could literally see. Mostly wearing black (in the sun, on a day that reached 34°C, or about 93°F), mostly in their twenties, and, I think I’m right about this, more young women than young men. There were a few people with megaphones making speeches, echoed by what seemed to be Zuccotti Park-style people’s microphones, and a few people with signs sponsored by official labor unions (the Hong Kong Confederation of Trade Unions) or political parties, but mostly it was young men and women sitting in groups while others gave out free bread, bananas, water, wet towels, and cooling packs (the kind I stick on Quentin’s forehead when he has a fever). The atmosphere was lively, joyous, and generous. Walking up to the protest, I saw a woman selling water bottles at 7 HKD each (a little under $1 USD); there seemed to be enough water being distributed for free at the demonstration, but I had expected price-gouging. The closest thing to negativity I saw at all was when I was part of a crowd pushing west on Gloucester Rd. toward Wan Chai to expand the area of occupation: where Gloucester met the off-ramp from Arsenal, some police vehicles led a few other cars past what I took to be their own blockade uphill; as the police drove past the demonstration, protesters booed at the cop cars (one police vehicle even found itself obstructed by particularly zealous occupiers. I do not believe the protesters would have had so much antipathy toward the police if it hadn’t been for the tear gas last night. I ran into two people I knew there, one former colleague of mine and another current student in the class I’m teaching this semester. Before the student strike, she had said she hadn’t made up her mind whether to boycott her classes the following week; a week later, she did in fact attend class; today, though, she was on the street—I take it that the police escalation last night contributed to her will, and she fortified her resolve, just as I imagine the resolve of many other demonstrators to have been fortified, as well. One thing she said to me, though, I almost wish she hadn’t: “Stay safe.” It’s something I’ve heard or read from any number of friends in Hongkong and around the world, and of course it’s generally good practice as well as something of a filler when you don’t know what else to say. It’s also a reminder that we’re dealing with a police force that has used brutality already, and that behind that police force is a national government that has called the military and their loaded and aimed weapons onto peaceful demonstrators in the not too distant past. And yet. “Stay safe” verges on blaming the victim: it puts the responsibility on us as politically active individuals acting collectively in solidarity to temper our demands and actions so that they don’t provoke violent retaliation. That, I think, is wrong. It’s the job of the police and the state that employs them to keep us safe, and when they fail at their job, we need to stop their vehicles and halt the economy that offers them legitimacy. And when that happens, well, I’ve rarely felt safer than I did today, walking as part of Occupy Central with Love and Peace. And in fact, a part of me is not sad to see that the police resorted to brutality so early and easily. Obviously I don’t want anyone to get hurt, especially people whose goals I support. But by engaging in violence the way they did, the police, and the structure of the state behind them, lost a lot of support in the court of public opinion. And that is a good thing. This doesn’t mean necessarily that we will win and the PRC will agree to have not only universal suffrage in Hongkong but a nomination process in which it isn’t tipping the scales, but it does mean that I can envision such an outcome, because the state has shamed itself in its actions. Against that, a movement such as this one, defined by youth, by love and peace, by aspiration and inspiration, will always find a way to win.